Italian cuisine, English philology, German cars, Spanish football, Polish heart. One of those lucky people who turned a hobby into a job. Social media can be a powerful tool but you need to know how to use it. It can help you to increase brand awareness, get new clients and, finally, earn more money but also can consume huge amounts of time and money without any return when used improperly. If you want to learn how to effectively conduct social media marketing for small business, this text is for you. One of the biggest and, unfortunately, popular mistakes I recognized that small businesses do, is using social media without any research. You need to know that every social media platform is characterized by a specific type of content, a frequency of publicizing posts, length of posts, etc. Also, not every platform will be suitable for your business and, having in mind that you don’t want to throw the money down the drain, you don’t have to be on every social platform that exists. What’s more, you shouldn’t be everywhere. Just focus on a few platforms where your business is actually being talked about, where your potential customers may look for your products / services. You can easily check it by using our tool which is free for the first 14 days as a trial version. Here you can create your free account. Having these keywords, our tool will show you all the mentions containing your keywords. To check what social media platforms are right for your brand, go to the “Analysis” section and then have a look at “Mentions by category” and “Most active sites”. Here you have listed platforms with the biggest amount of mentions related to your keywords. Tip: Try to be specific and avoid general phrases. For example, if you are managing a project for an Italian restaurant, don’t use phrases like “Italy” or “cuisine” because you’ll get flooded with unnecessary mentions unrelated to your business. Another way to avoid unnecessary mentions is possibility to set required and excluded keywords. Out tool will collect mentions only with required keywords and delete keywords including excluded keywords. You can set those keywords in the “Project Settings” tab. 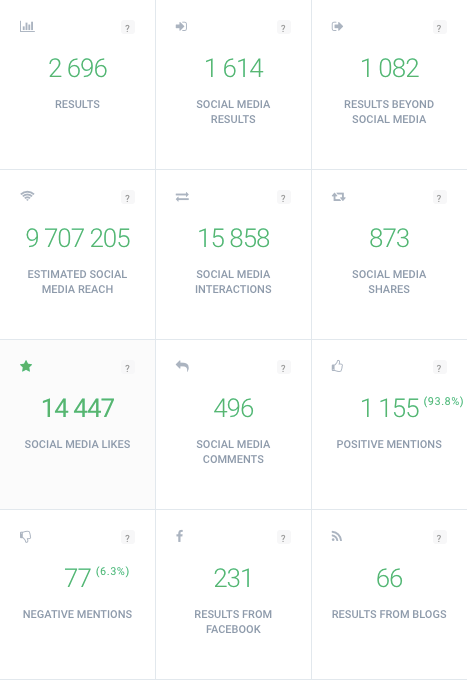 With this data you know on which platform your business in popular and where your potential clients may look for info about your products/services so reaching them will be much easier. Research conducted by Sprout Social showed that 76% of responders were more likely to buy from a brand they felt connected to on social media than a competitor. What is more, according to The Social Habit, 32% of customers expect a response to their question within 30 minutes online. This data shows us how important in building relationships with clients is talking with them. Nowadays your brand can be closer to the customers than ever was – make use of it. If somebody asks you anything in a comment or sends you a direct message – you are obligated to answer. In most cases, it won’t take a lot of time but the outcome can exceed your expectations. Another important factor in building relationships with clients is showing your human side, especially when your business is small and quite young. When people will see that there is a real person on the other side they’ll be more likely to trust that you are a legit company. Feel free to introduce your team, use a friendly tone while communicating with customers, use your follower’s name while answering their comments, emoji are also welcome when it fits your business. Avoid being just another faceless company, especially while conducting social media marketing for small business. If there is a special day like, for example, International Women’s Day, post a funny video with wishes or photo with flowers brought to your office by a male part of the staff. Show people that your company is a living structure, not a soulless machine. It is connected to building relationships with your customers. Again, it doesn’t cost you much but can give you much more than you predict. When somebody is using your product, your service and is talking about it on social media – react! It doesn’t have to be something big, just say “Thank you”, reshare the post. It won’t take you a lot of time and effort but you’ll show your customers that they are important for you, that you care about what they say about you. How can I know that somebody is talking about me? Having Brand24 account it’s a child’s play. Just open your dashboard and go to “Mentions” section. Here you have listed mentions and can easily go to their source to answer them. It should be obvious for you and you should treat this as a verification of your activities and indicator in which direction you should go. Without measuring your campaigns you can lose money spent on it and your effort will be in vain. But first, think about what your goals are, what do you want to achieve by running social media promotion activities. selling your product by social media. If you are a hotel manager, you can reach new followers by showing nice pictures of your hotel and the surrounding area on Instagram and use Twitter to answer your customer’s questions. Tip: Remember about setting SMART goals – specific, measurable, attainable, relevant, and timely. With specific goals, you can measure them. You can do it by using our app. In “Mentions” tab, you can see a chart showing changes in the number of mentions, social media reach, likes and shares of posts containing your keywords. Although it may not happen to you, it’s the knowledge that you definitely should accrue. Social media crisis management is something that distinguishes a good social media manager from a bad one. It’s easy to write a post, create a fanpage but knowing how to deal with social media crisis can be priceless. And sometimes may save your business from collapse. It can take very different forms but I’d like to focus on the most important one – an unhappy client complaining about your product / service online. How do you catch a client like this coming in? Learn more: Read this article to get to know how to set up notifications like Storm Alert. Here is the first lesson – an unhappy client is your fault. Period. Even if the complaint may be exaggerated to you, you can’t leave your unhappy client alone. You are obliged to react, same as I told you when we were talking about happy clients. It’s a part of building relationships. Just assume that if anybody is complaining about you, your company, your product it’s because of your oversight. You are only human and making mistakes is a human thing. Of course, it may be exaggerated but then just admit that the client is right, apologize, offer something in compensation. Just treat it like a part of your job, that unhappy client may appear and be ready for it. The second lesson – you are not allowed to argue with a customer. Never. As I said before, you are only human and you have a right to make mistakes. Admitting it shows other followers and clients that you are a serious businessman and you can take responsibility for your mistakes and you can save your face. When you start to argue, the unhappy client may feel under attack and other followers may start to defend him and then you have an army against you. In the worst cases, they may do screenshots of your impolite answers and you’ll end up as a bad case practice for the rest of the industry. Yes, patience is one of the most important factors in social media marketing for small business. Be prepared that you won’t get tons of followers, likes, comments, shares, etc overnight. What’s more, building a strong and trustworthy social media presence may take years but it’s worth waiting. Just be patient and trust your journey, take care of your clients and followers, give them valuable content they are looking for, put into practice the advice I’ve described to you and after some time you’ll see the results. You’ll get more and more unique followers, your profile will be more and more popular and more and more potential customers will choose you beyond the competition. Tip: Every time you buy fake followers, likes or comments, a panda bear dies somewhere in the world. Don’t do that, please.